A major enhancement called G.INP has been introduced to my fibre broadband FTTC connection, as part of BT's rollout of a new technology aimed at improving fibre broadband speeds and reducing errors. In this article, I look at G.INP and its benefits, and show how you can tell if this technology has been implemented on your line. G.INP appears to significantly improve lines affected by crosstalk interference, even in the absence of vectoring! Latest! Because some modems (e.g. the BT Home Hub 5 Type A are incompatible with the full implementation of G.INP, BT has now implemented G.INP on the downlink only). I had a pleasant surprise yesterday morning as I looked at the front status page of my Billion 8800NL modem router (shown above), and that was a significant improvement in download speeds due to the switch-on of a fibre broadband enhancement called ‘G.INP’. Furthermore, the number of errors on my line have decreased significantly. Readers of the recent article Early Deployment of Vectoring is Essential to Avoid a Crosstalk Crisis with FTTC Fibre Broadband will know that my FTTC line has increasingly suffered from crosstalk as the penetration of fibre broadband has increased in my village. Internet forums are awash with similar stories. I was the first person in my village to have fibre broadband installed, and the initial downlink connection speed was 80 Mbps, with a maximum attainable rate of 145 Mbps. Since then, downlink connection speed has declined with increasing fibre broadband take-up, which now stands at well over 50% of premises. With crosstalk, the download connection speed had dropped to 74 Mbps. Yesterday, download connection speed went back to 80 Mbps with G.INP switched on – a significant speed improvement without any noticeable change in latency (ping times). Although vectoring is seen as the key technical solution for combatting crosstalk, these results suggest that G.INP can really help to mitigate the effects of crosstalk in the absence of vectoring. 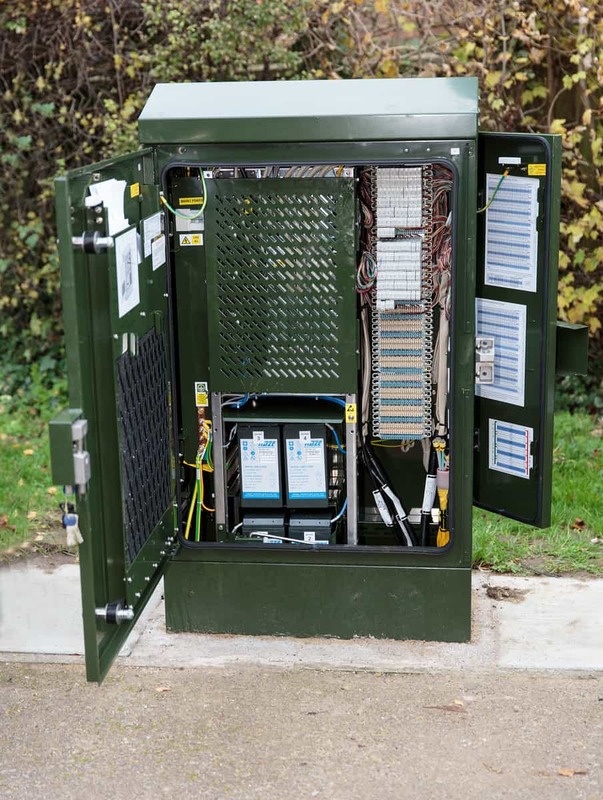 G.INP introduces a much-needed additional feature to the Digital Line Management (DLM) capabilities of the fibre street cabinet to better (and more efficiently) cater for all types of line condition. G.INP is an enhancement that makes fibre broadband signals significantly less sensitive to sporadic noise and interference, to maximise broadband speeds. This enhancement is so significant that Huawei describes G.INP as a “new technology” that gives DSL “a fresh lease of life”. Fibre broadband signals travelling along copper wires are highly susceptible to impulse noise and interference. For example, appliances with power adapters, power switches and electric motors can cause significant degradation to broadband signals and I have had plenty of personal experiences of this happening, so no doubt this is a common occurrence among broadband users. As an example, a faulty power supply on a DVD player caused the broadband connection of most people within my street to drop sporadically for several weeks (before the problem player was identified). A new LCD monitor that I had purchased caused regular disconnections and significant declines in my broadband speeds before I put two and two together and identified the cause of the problem. As yet another example, an old central heating thermostat in my hall used to cause my modem to drop its connection every single time the house reached its target temperature (before it was replaced). Such sources of noise and interference can be frustratingly difficult to identify and remedy, particularly if they are beyond your control. As described in our crosstalk interference article, fibre broadband signals are also susceptible to interference from other fibre broadband signals carried along nearby copper wires – called crosstalk interference. Although vectoring is seen as a core technology for combatting crosstalk, our results with G.INP suggest that G.INP can help to mitigate the effects of crosstalk interference. This will be welcome news since vectoring has not yet been rolled out nationwide. It is important that errors caused by noise and interference are minimised with fibre broadband, particularly as some services (e.g. video) are particularly sensitive to packet loss or errors. applying interleaving and error correction, which reduce throughputs and introduce extra delay (or latency). These approaches can significantly degrade the actual throughputs of a fibre broadband connection. They are simply not suited to mitigating noise/interference that is infrequent and sporadic in nature since they apply to the whole duration of a connection rather than the short duration of a noise ‘event’. Sporadic occurrences of noise are termed Single High Impulse Noise Events (SHINE), and may occur when a particular appliance is turned on or off, for example. The ITU-T has developed a technical standard – called G.INP (also known as ITU G.998.4)– that is specifically designed to mitigate sporadic occurrences of noise and interference. G.INP introduces an efficient data packet retransmission capability to broadband systems. With G.INP, data packets that are affected by sporadic noise and interference are simply resent. G.INP allows a fibre broadband line to generally sync higher than without G.INP since it provides the mechanism for retransmitting the occasional lost data packet without having to lower connection speeds or introduce interleaving. For many broadband connections, reducing connection speeds and introducing interleaving and coding to combat sporadic noise and interference are simply overkill and inefficient (and cause unnecessary performance degradation). If a fibre broadband connection suffers infrequent noise ‘spikes’ at certain times of the day (for example, caused by a faulty central heating thermostat), only a tiny proportion of the data packets sent during the day may be affected. Reducing connection speeds and/or introducing interleaving and coding to try to combat this could noticeably degrade the broadband connection for the entire connection period. With interleaving, the original sequence of data packets is chopped up and rearranged so that packets that were originally together are spaced out in time to make them less sensitive to noise and interference bursts. At the other side of the connection, these packets are put back together in their original order. Interleaving inherently introduces time delay, since a particular packet may have been rearranged to be sent at a significantly later time, and there is an additional processing delay at the other end of the connection when all the received packets have to be reassembled in their original order. According to BT, interleaving can increase the latency of a connection by up to 40 ms, which can "adversely affect some delay-sensitive applications", such as online gaming and voice telephony (e.g. Skype). With interleaving, all packets are delayed, irrespective of how many are affected by noise and interference. If noise and interference is sporadic, it makes much more sense to retransmit only the affected packets (i.e. using G.INP) than introduce latency to all the packets sent. For many fibre broadband connections, G.INP may be perfectly adequate on its own to efficiently maintain a connection with low error rates without the need for interleaving or reduced speeds. BT Openreach has already carried out successful trials of G.INP, and is now in the process of rolling out G.INP in its fibre broadband network. An increasing number of broadband users on Internet forums are reporting that G.INP has gone live on their connections. The extent to which G.INP will be rolled out to BT's entire network is currently unknown, as is the status of vectoring deployment. G.INP roll-out may take several months. However, the initial deployment of G.INP is clearly great news as G.INP does seem to significantly lower error rates and increase connection speeds without the latency penalty seen with interleaving. It also seems to be effective at combatting crosstalk interference - not just sporadic impulse noise. It's not exactly obvious when G.INP has been enabled, and statistics provided by your modem may be somewhat limited and confusing. There is much confusion about G.INP currently on Internet forums, with broadband users unsure whether their line is G.INP-enabled or not. What makes the situation worse is the fact that some modems may not currently support G.INP. For those with modems that do not support G.INP (for example, the BT Home Hub Type A), the Billion 8800NL (or Billion 8800AXL) makes a superb upgrade. Latest! Please note that due to incompatibilities of some modems, BT has removed G.INP on the uplink across its network but, most importantly, G.INP is operational on the downlink to provide significant improvements in downlink speed. 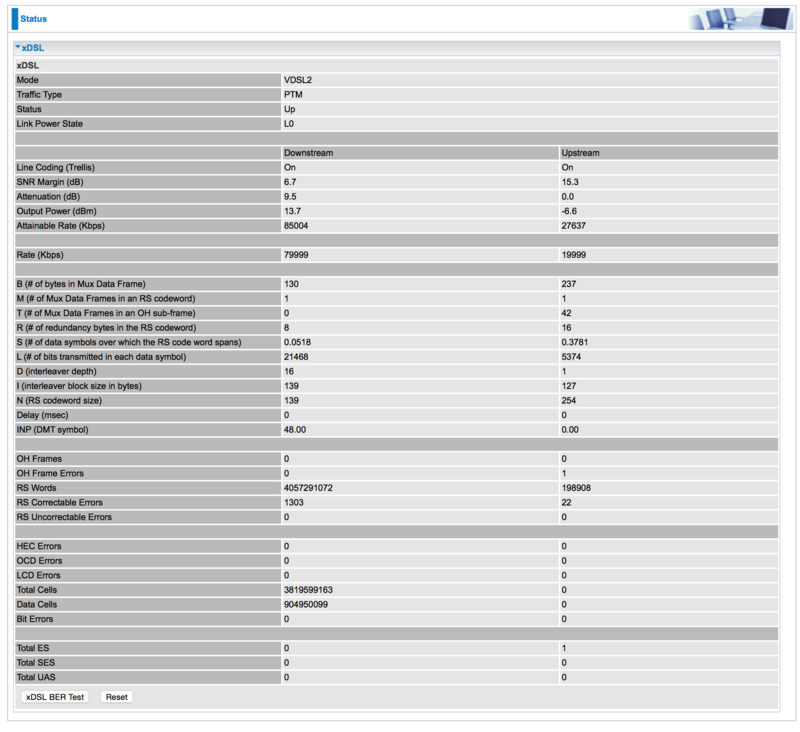 It is possible to tell that G.INP has been implemented from your modem statistics, and the screen shot below shows the statistics page for the Billion 8800AXL. You can detect the existence of G.INP if the INP (DMT symbol) value is set to 48.0, with an interval depth or 8 or 16.